Published on September 30, 2012 by Jennifer S.
The first time I climbed the Traveler’s Tower I was in second grade. 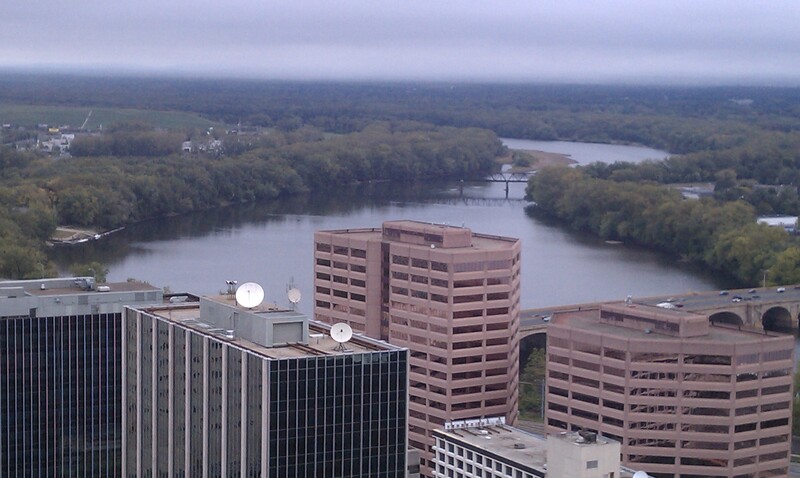 My memory of the field trip does not actually include the observation deck, however. I remember scratching my wristwatch on a street-level wall. And I believe one of the other classes got ice cream later on at Elizabeth Park (they had the cool teacher). The funny thing is that now, over 29 years later, I’m realizing that the way I remember the watch scratching incident, it couldn’t have happened. I wear my watch on my left wrist, and as I remember the wall, it was on the right. Yesterday I inadvertently left my current watch at home, and it was more of a hot beverage day than cold ice cream. However, I found out the tower was going to be open for tours, and was intent on being in line when they started. 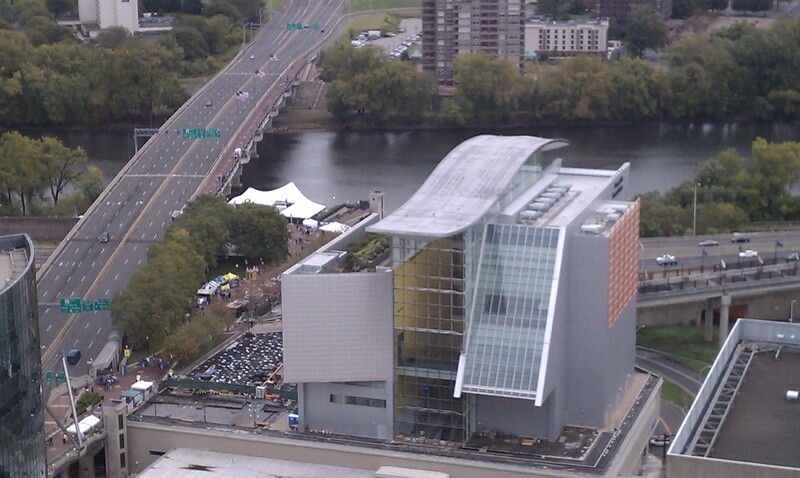 The tower was open as part of downtown Hartford’s EnvisionFest. I had some fun getting there. As I biked along Capitol Ave., a well intentioned pedestrian I encountered at the intersection with Laurel St. informed me I wanted to turn right, not continue straight. As the light turned green, I tried to quickly explain that I was not riding the Discover Hartford route. I’m not sure he understood. I locked up my bike and walked toward Travelers. After circling the block and not finding anything indicating where the tours would begin, I decided to ask at an information booth. 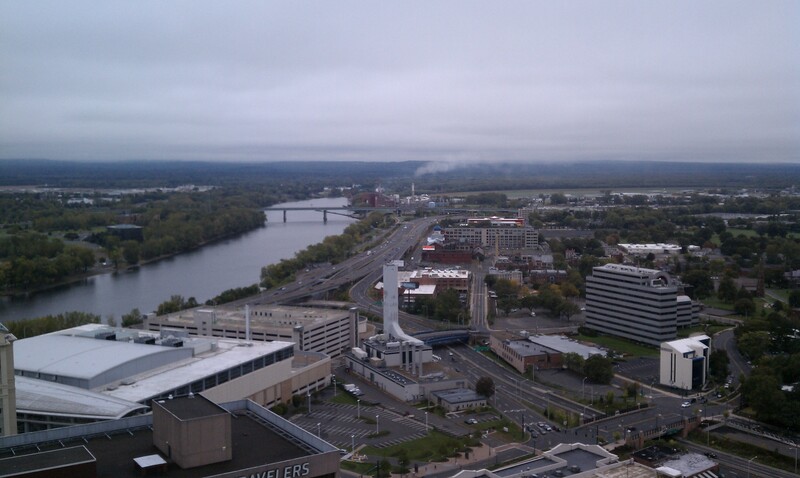 One girl tried to tell me the Travelers building was in the direction of Bushnell Park. She did not believe me when I pointed directly at it and basically told her she was wrong. My cycling attire (helmet and fluorescent jacket) caused some confusion as well. A guy at the same booth suggested I wanted to be in Bushnell Park because that’s where the bicycling was taking place. I had a very hard time convincing him the tower tour had nothing to do with bicycles. Eventually I found the entrance (which had not been open when I first passed by and was not the one they had originally intended to use) and was in the first group to ascend 24 flights in the elevator and 70 additional steps (someone asked, I didn’t count). Despite the clouds, it was still a great view. 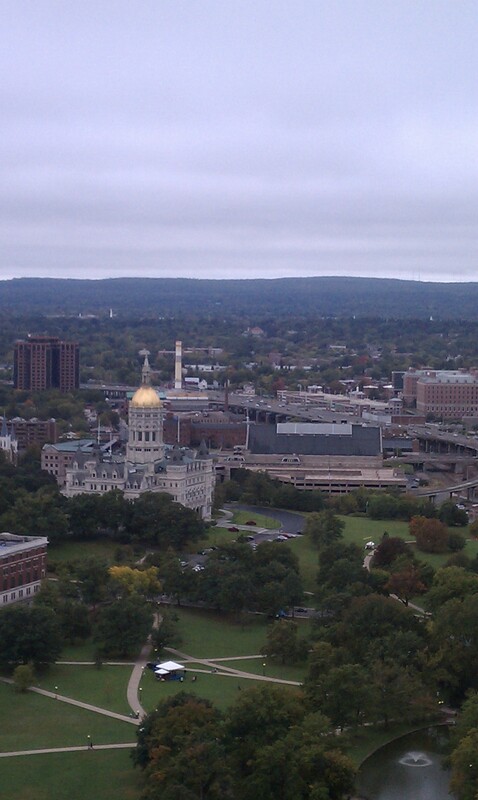 If you have ever wondered just how much of Hartford is covered with highway and pavement, this view to the South should answer that question. To the East is the Connecticut Science Center and more highway. While I was admiring the view, I kept thinking about a blog entry I wrote for work a little over a year ago, about the Hartford Public Library’s Caroline Hewins taking students to see the view from the Travelers building. Coincidentally, I left Travelers and immediately headed over to Hartford Public Library to work the multi-touch table, on display as part of EnvisionFest. The table is essentially an oversized iPad connected to a big screen tv. It is programmed with highlights of Hartford history, including the story of the Charter Oak, radio personality Bob Steele, actress Katharine Hepburn, scans of postcards and glass negatives. 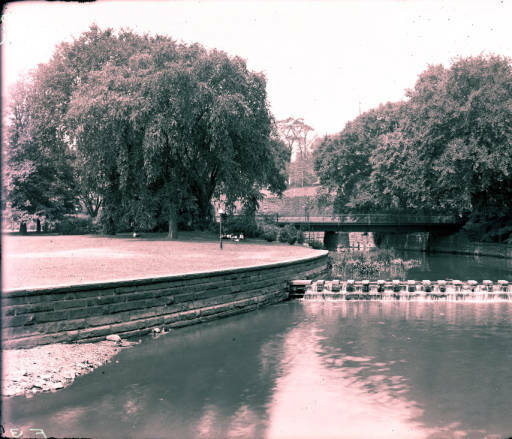 Stepping Stone Bridge, Bushnell Park. Image property of the Hartford History Center, Hartford Public Library. Many of the people with whom I spoke knew that the river now runs underground. But for those who were not aware, it was a great story to tell (you can read more about it in a New York Times article, a piece in the Hog River Journal, and listen to Catie Talarski’s recent trip through the conduit). Not only were these people surprised to learn about the river, they were equally astonished when I told them the library building now stands directly above a portion. The Whitehead Highway runs over the covered river. Creating a tunnel over the highway, is the Hartford Public Library. I got to see the city from above in the morning, and teach with archives in the afternoon. How much better can a day get?